What is the culprit or vice that is stealing the white from your smile? Your morning cup of coffee (and the next one and the next one)? Maybe it's one of your healthy diet choices that is dimming your (once) pearly whites, like delicious, fresh picked berries. For most of us, our regular diets contain smile dimming culprits, even some of our medications. As for myself, my culprits are tea, berries, allergy medications, as well as an occasional glass of wine. My smile really needed a dazzle intervention! There's no question that a healthy, white smile can make a significant contribution to one's overall appearance. Fortunately, there are alternatives to expensive dental office procedures that can dramatically boost your smile to dazzling right at home. With results evident after the first five minute treatment, Plus White can add the sparkle you seek, reaching full benefits in as little as two weeks! 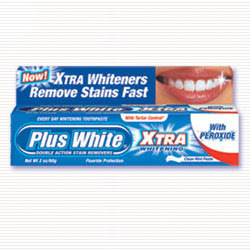 Plus White offers a full line of teeth whitening products to help you reach your full smile whitening potential. With a wide range of whitening options, including a formula especially designed for those with sensitive teeth, as well as special whitening toothpastes, there is a Plus White product perfect for helping you face the world with a bright, beautiful smile! I was given an opportunity to test the Plus White 5 Minute Speed Whitening System. In as little as five minutes, right at home, you can begin to take advantage of the same process dentists use (oxygenating action) to gently but effectively lift away stains. Now, with the bleaching power of Plus White, whitening will begin to work with the first application and you'll see whiter and brighter teeth within days! Plus White Tartar Control Pre-Whitening Rinse helps remove film and loosen stains from your teeth, enabling the Gel to lift away stains even more effectively. 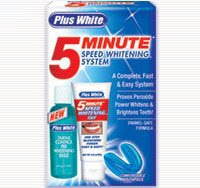 Plus White 5 Minute Speed Whitening Gel now with bleaching power for fast, effective whitening and brightening. Comfortable Mouthpiece with a double-sided tray that whitens top and bottom teeth at the same time for faster results and better whitening. Using the Plus White 5 Minute Speed Whitening System was easy! First, you prep your teeth for brilliance with the pre-whitening rinse. A teaspoon of the rinse, mixed with a couple teaspoons of lukewarm water. Swish and rinse out. Next, you add a small amount (really, small amount or you'll be foaming!) of whitening gel to the mouth tray. You can control which teeth get the glamming treatment by only placing gel in the areas of the tray that correspond to your "problem" teeth. Front teeth only, full upper set or upper and lower can all be treated at the same time. Place the mouth tray in your mouth, bite down gently but firmly and leave in place for 5 minutes for mild needs or up to 10-15 minutes for tackling a more challenged smile. That's it! Just rinse mouth and tray with lukewarm water after the application, taking care to not swallow any whitening gel and let the mouth tray air dry. The instructions recommend to treat your teeth twice per day for two weeks and taper off to one or two applications per week after that to maintain your pearlier whites. Honestly, I was really skeptical that I would see any results after only one application, but there was definitely a noticeable difference! After a week, I was dazzling not only myself, but the rest of my family as well! I was really pleased with the results. Whether you need a dazzle intervention or just a bit of assistance, Plus White offers fantastic products at affordable prices so you get whiten up your smile and not break the budget while doing so! Exploring the Plus White website, I found helpful topics on Proper Brushing and Flossing Techniques, as well as great Whitening Tips! Plus White is available at a wide number of popular retailers, but before you shop, be sure to check out the Savings Tab on their website for a printable coupon to save a $1.00 off your choice of Plus White products! Plus White is generously offering That's What She Said readers an opportunity to win a Plus White 5 Minute Speed Whitening System! To enter this giveaway, you must publicly follow That's What She Said via Google Friend Connect (left sidebar). This giveaway is open to residents of US, 18+ and will end on Saturday, September 17, 2011 at midnight, EST. Winner will be chosen randomly from all eligible entries and notified by email. Please leave your email address, in anti spam format, in your first entry comment so I may email you if you are the winner. Winner will have 72 hours to respond before I must move on to a runner up. To be eligible to enter this giveaway, you must publicly follow That's What She Said via Google Friend Connect (left sidebar). For mandatory entry, please visit the Plus White website and tell me in a comment here which product you would most like to try and why. * Like Plus White &/or That's What She Said on Facebook, leave a comment here with your Facebook name. 2 entries for each. * Tell me in a comment what the culprits are that are keeping your smile from being brilliant. 1 entry. * Follow That's What She Said (tsue1136) on Twitter and leave comment here with your Twitter name. * Tweet about this giveaway. Limit of 3 tweets per day. One entry per tweet. Leave a comment here with a link to your tweet. * Enter any of my other active giveaways. Leave a comment here letting me know which. 2 entries per additional giveaway. * Leave a comment on any non-giveaway post and then leave a comment here letting me know which. 1 entry per additional post. * Subscribe to That's What She Said via email or RSS feed (left sidebar). Leave comment here with your applicable name. 1 entry for each. * Put my blog button (left sidebar) on your blog or site. Leave comment with a link so I can find it. 2 entries. * Share this giveaway in some other fashion: post on Facebook, Stumble it, Alexa, Digg, Technorati, Blog it, post on a giveaway linky - anything goes. Sharing must have direct link back to this giveaway. Leave a link to your sharing in your comment so I can find it. 5 entries per additional sharing. Congrats to kittenish, comment #36, courtesy of Random.org! On behalf of Plus White and That's What She Said, thank you to all entrants for following and participating! I was provided with a Plus White 5 Minute Speed Whitening System to explore for the purposes of creating this feature. Plus White is responsible for supplying and shipping giveaway prize. Information and images sourced from various Plus White sites. 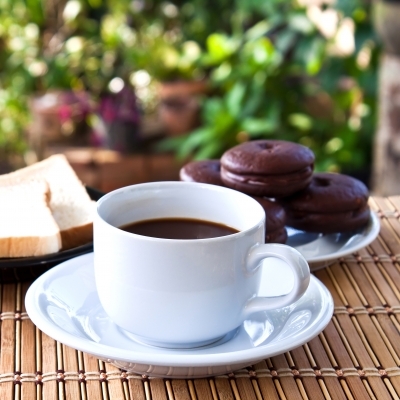 Coffee Image. The opinions above are both honest and my own. Facebook is not responsible for nor involved in this giveaway in any fashion. I follow you via GFC as Joder. From their site I'd like to try the Plus White 5 Minute Bleach Whitening Kit. I think my teeth need something really strong to be effective and this product sounds potent. I follow you on FB as Jody F.
I'd most like to try the Plus White® 5 Minute Bleach Whitening Gel for Sensitive Teeth, because my teeth can be sensitive and some whitening treatments I've tried before left my teeth aching for hours. I think the Plus White® 5 Minute Bleach Whitening Gel for Sensitive Teeth would be great for my sensitive teeth! I'm a GFC follower (sksweeps) and I'd like to try the Plus White® Xtra Whitening Toothpaste because it would help whiten my teeth every day! The culprits keeping my teeth from being white are my morning cup of coffee, an occasional diet coke and berries! I am a follower via GFC. I would like to try the Plus White® Xtra Whitening Toothpaste with Peroxide so I can keep whitening my teeth on a daily basis. I like Plus White on Facebook. I like Tsue ~ That's What She Said on Facebook. Coffee is definitely my culprit to keeping my teeth pearly white! I would like to try the whitening booster because you can add it to your favorite tooth paste. I would love to try the Plus White® Xtra Whitening Toothpaste because it would help to whiten my teeth everyday! I liked Plus White on FB! I followed @tsue1136 on twitter! gfc follower ticklemetiffyyyy and I would love to try the booster that you add directly to any toothpaste! My teeth are not as white as they used to be because of my coffee habit! with Peroxide because it looks like the best of both worlds. My main culprits are the antibiotics I took as a child as well as the length of time I took to get all my wisdom teeth removed. Follower, I would love to try the Plus White® Xtra Whitening Toothpaste Cool Mint Gel, for extra whitening, thanks! I follow via google and would like to try the Plus White® Xtra Whitening Toothpaste because it would help whiten my teeth every day. I'm a GFC follower :) I want to try the whitening booster that you can add to your tootpaste. Kelley with winking cat avatar is following and I'd like to try the plus white toothpaste with peroxide because that looks like an easy way to whiten. My email is on my facebook, Thanks! I follow via GFC user Amy_M. I'd like to try the Plus White 5 Minute Bleach Whitening Kit. I drink a lot of coffee and need something strong and effective. Coffee, diet Coke and red wine are my favorite enemies to white teeth. with Peroxide because I drink a lot of tea and coffee! I like Plus White on Facebook. (Annemarie Zito) Post 1. I like Plus White on Facebook. (Annemarie Zito) Post 2. I like That's What She Said on Facebook. (Annemarie Zito) Post 1. I like That's What She Said on Facebook. (Annemarie Zito) Post 2.